Every once in a while I would like to honor those who have survived breast cancer. This post will be one of many that I would like to share with everyone, and it gives me an opportunity to write in a way that I haven't attempted before. I have asked many breast cancer survivor groups to share their stories with me, not only for my blog, but for my new book being edited presently. I truly would like to hear from as many of you as possible as it relates to your story of survival as well as surviving siblings, spouses, children or parents whose family member couldn't win that frightful battle. Of course many of you know of my mothers struggle(Mary's cousin) with breast cancer, but her story will be told in my next cookbook that is dedicated to her and all survivors and those who could not survive breast cancer. Mary was born in 1965 to my great aunt Rita Barbara Meeks. Aunt Rita was my mothers' aunt and had a cancerous tumor removed from her breast while in her late 30s. She recovered, only to have cancer return in her kidney(which she had removed), lung(she also had removed) and esophagus. Aunt Rita died March 1, 1991 from the esophageal cancer and she is truly missed by all those who knew her. I often think about her as being joyous and comforting to us children when my Mom passed on. Her daughter, Mary, my cousin, has endured tribulation as well from this devastating affliction. Although Mary led an active, fulfilling and cautious life, that other-worldly voice still found time to whisper in her ear that dreaded 'C' word. Rich, her husband of 26 years, doted on her as passionately as if on their first date. It was the day he came home from another, solo mountaineering trip that his caring persistence paid off when he found a lump in her breast.Always the mountain climber, adventurer and caring father and husband, he knew of Mary's genetic susceptibility when it came to cancer and often double checked his wife's self-examination. "I'll never forget how his hand snapped back, like it touched something hot when he felt it.". Although Rich was concerned, Mary was hopeful that this oblong lump would disappear on its own, so she decided not to pursue another opinion, even though Rich was vehemently suggesting otherwise. A few months later, because of a chest cold, she visited a doctor. After this checkup, and getting ready to leave, the physician asked her if she had any questions. She mentioned that her husband had found a lump and she may as well have it finally looked at if he had the time. Within 2 weeks, Mary, Rich and the rest of the family received word of her breast cancer. She reflects "As soon as I heard it, a calm washed over me, tears fell silently, and my first thought was not why me, but why not me." After all, Mary's mother and her aunt died of cancer, and she had lost her brother from a different illness. "If I am cured through treatment, great. If I end up passing, then I was okay too because I would be in God's presence with Mom, Eddie, and everyone I loved that went before. " Chemotherapy was ruled out as treatment for Mary, but she did have 2 surgeries to remove the tumor and lymph nodes, followed by 3 months of radiation treatment. She survives today, cancer free, but not without her and her three children going through another tribulation. Her husband who had been so cautious, determined to never leave Mary's side throughout every doctors visit during those emotionally frightening days throughout her ordeal, was to be embraced by Mary's mother, aunts and brother before she would be reunited with them. Rich took one last adventure to the high mountains of Canada, all alone as he enjoyed. 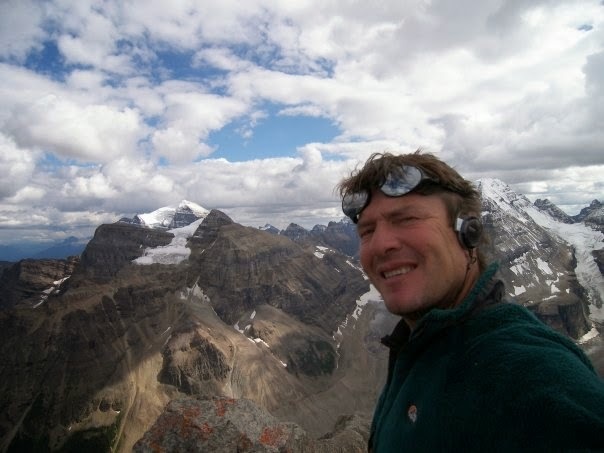 After failing to check in with his wife at a predetermined day and time, the Canadian government fount him on August 16, 2013, dangling from his climbing gear, unresponsive. This day is significant in her family. It was Mary's mother's birthday and the same day of her cousins death from breast cancer. What a beautiful story. I too am a survivor here in NE and it is stories like this that make you both smile AND cry. Beautiful lady, beautiful family and beautiful story. Let us know periodically how she is doing. I so love stories like this and hope the best for her and her loved ones. And btw, you did a great job for this being your first writing about something like this. Wish it was a little longer though so I could sit here and smile just a little more. Oh Jim! I am reading this with tears in my eyes and pride in my heart that you are my family and my friend. You did such a beautiful job writing this and you honor not only all the women in our family, but all women. All I can say is thank you thank you and I am so very proud of you as I know your mom and my mom are. Amazing story Chef and Mary. You can tell there is a special connection there and I hope you continue with this bond. Gloriously glorious. Great story. TY for sharing. Looking forward to many more. Kind of a nice change of pace from cooking, but I do love your cooking and genealogy posts as well. so beautiful. And the dates at the end kind of puts things in perspective. Thank you for sharing and God bless this family.